WILLIAMSPORT, Pa. - Coming off a bye week with a chance to get healthy, the Lycoming College football team will head to 22nd-ranked Delaware Valley, the defending Middle Atlantic Conference champions, looking to enter the race for the conference title during the showdown on Saturday, Oct. 13, at 12 p.m. The Warriors (3-2 overall, 2-1 MAC) are looking for their first win over the Aggies since a 43-42 upset in 2015. The team is led by a defense that allows just 23.4 points per game and is second in the league, allowing 106.4 rushing yards per game. Delaware Valley (4-1 overall, 3-0 MAC) has won 15 straight conference games dating back to a 19-0 loss to Stevenson on Oct. 22, 2016. • The Warriors are one of three teams remaining in Division III to not allow a fourth-down conversion in 2018. 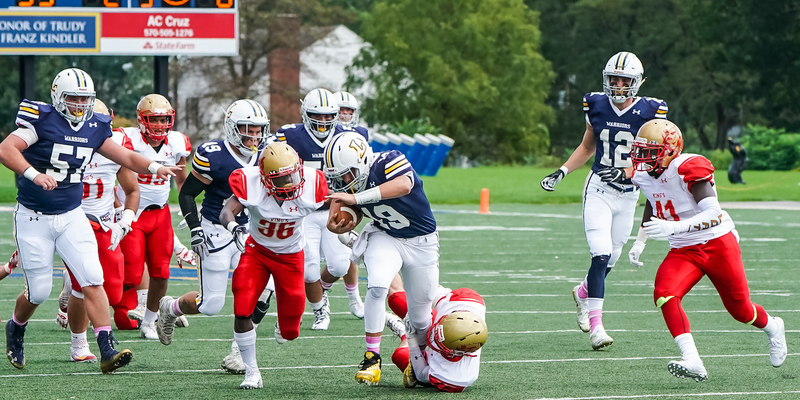 • Lycoming leads the MAC in blocked kicks (3), first downs allowed (74), kickoff return average (23.44), red zone defense (.692) and time of possession (33:45). • Senior Nick Costello needs 104 more receiving yards to become the sixth player in school history to post 2,000 in a career. Jr K Jamie Fisher leads the MAC in field goal average per game. • Junior Jamie Fisher leads the MAC and is eighth in Division III with an average of 1.4 field goals per game. 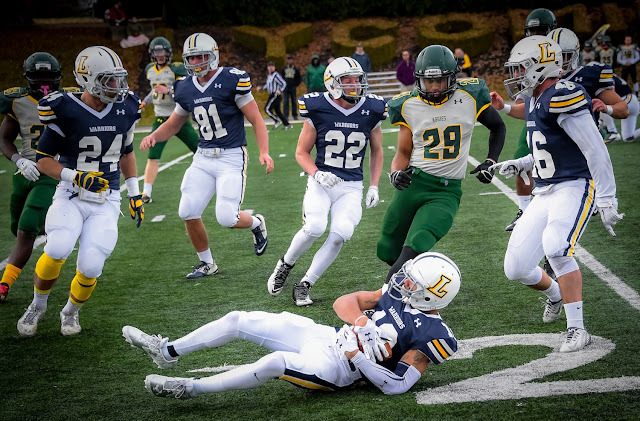 • Three Warriors - juniors Keith Batkowski and Jacob FImbres and sophomore Len Wyda - have rushed for 80 yards in a game this year, the first time since 2015 the team has achieved the feat. • Freshman Elijah Shemory became the first quarterback to rush for two scores against King's since Zach Klinger '13 ran for three against FDU-Florham in 2011. #19 Fr QB Elijah Shemory scores two touchdowns against King's. Freshman Elijah Shemory snuck into the endzone twice during the team's game against King's on Sept. 29. It was the first time a Warrior quarterback scored twice in a game in seven years, since Zach Klinger dove in three times in the 2011 season finale against FDU-Florham, a 54-7 win. Shemory has three rushing touchdowns this season, all of quarterback sneaks.